March 19, 2012, Auburn Hills, Mich. - Following the successful debut of the Dodge Charger Pursuit, Dodge will begin offering a Durango Special Service model for fleet use. 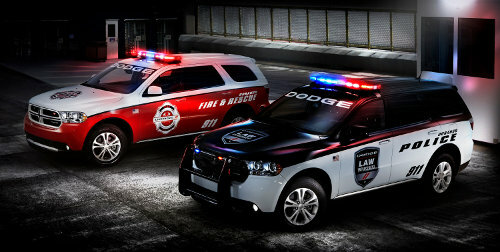 The Dodge Durango Special Service SUV is specially designed to handle the rigors of everyday use by police and fire departments and fleet customers. Chrysler Group fleet operations will start taking orders now, with deliveries expected to begin in the second quarter of 2012. "We're incredibly excited to add the Dodge Durango Special Service to our line-up of law enforcement vehicles," said Peter Grady, Vice President of Network Development and Fleet Operations. "Adding Durango to our current Dodge Charger Pursuit and Ram 1500 Special Service vehicles allows us to offer a full range of fleet sedan, SUV, and truck options to law enforcement and government agencies." 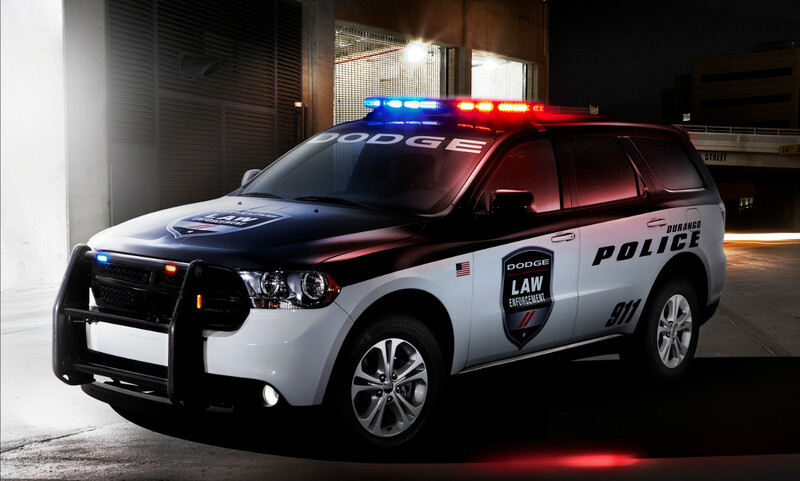 "The standard Durango has several class-leading attributes, such as power, towing and a driving range of more than 550 miles, so it is a natural to become a great utility tool for law enforcement and general fleet customers," said Reid Bigland, President and CEO -- Dodge Brand. "This Special Service version will no doubt be a major asset to any agency in need of a durable, yet comfortable, SUV." The Dodge Durango Special Service carries all of the SUV's class-leading utility, such as available 7,400-pound towing capacity, more than 550-mile driving range with the Pentastar 3.6-liter V-6 engine, and available 360 horsepower 5.7-liter HEMI V-8 engine. Available in rear- or all-wheel drive, the Dodge Durango Special Service model comes with the following additional components designed for the rigors of daily fleet use: A heavy-duty brake package, heavy-duty battery, larger-output 220-amp alternator and heavy-duty water pump and engine oil cooler. Dodge Durango is an Insurance Institute for Highway Safety (IIHS) "Top Safety Pick," and Special Service models offer customers the same 45 safety and security features, including standard Electronic Stability Control (ESC), electronic roll mitigation (ERM), Hill-start Assist and standard Trailer-sway Control (TSC) to enhance off-road and towing capabilities. Other standard safety and security features include seat-mounted and side-curtain air bags in the front row. The curtain air bag extends protection to second and third-row passengers (third-row seating deleted in Special Service models). Durango also includes standard front-row active head restraints. With its four-wheel independent suspension, near 50:50 weight distribution and responsive steering and handling, Durango has driving dynamics unlike what you typically find in a sport-utility vehicle (SUV). No other SUV on the road compares with the all-new Dodge Durango's distinctive bold Dodge design that craftily houses a flexible and premium interior, covered in soft-touch materials. Durango features more than 30 storage areas and a rear cargo area of nearly 85 cubic feet that fits a 10-foot ladder with the front passenger seat folded flat. 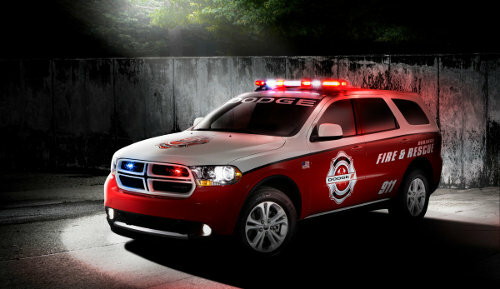 The 2012 Dodge Durango is an Insurance Institute for Highway Safety (IIHS) Top Safety Pick. Durango also delivers the perfect blend of power and fuel efficiency. Its award-winning 3.6-liter Pentastar V-6 engine delivers 290 horsepower along with a best-in-class driving range of more than 550 miles on one tank of fuel -- that means Durango owners could drive all the way from San Diego to San Francisco or New York City to Boston and back again without needing to stop for fuel. The available HEMI V-8 engine with Fuel Saver multi-displacement technology delivers a best-in-class 360 horsepower and 390 lb.-ft. of torque. Both engines deliver best-in-class V-6 and V-8 towing with standard Trailer-sway Control on all models (V-8 -- up to 7,400 lbs. and V-6 @ 6,200 lbs.). Durango also features more than 45 safety and security features.